Children’s Literacy Initiative is proud to announce that a new report from the Institute of Education Sciences (IES) includes CLI among projects that have positive impacts on teacher practice and student outcomes. The report confirmed that CLI’s Investing in Innovation (i3) Validation intervention met the short-term and long-term goals of i3, including conducting a strong evaluation that produced high-quality data with positive results. CLI’s intervention was among just 13% that met the long-term goals of i3, including the 18% that had showed a positive impact on student achievement outcomes and the 78% that delivered the intervention as closely as possible to the design of the program model (referred to as implementation with fidelity). 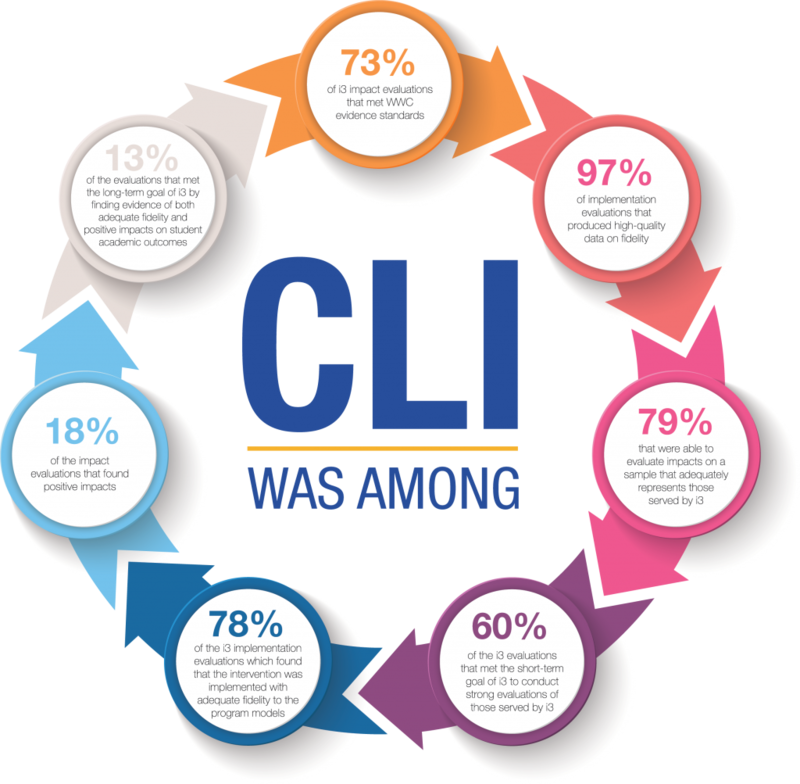 CLI also met the short-term goals to provide high-quality data on implementation fidelity and independent impact evaluations that meet What Works Clearinghouse standards — a set of rigorous criteria for education research that identifies well-designed studies, trustworthy research, and meaningful findings — and adequately represent the population served by the intervention. CLI’s i3 evaluation consisted of a randomized control trial conducted in 78 high-poverty schools in four urban school districts. The impact evaluation was designed to evaluate the effect of CLI’s professional development on kindergarten through second-grade teachers’ classroom environment and literacy instruction, as well as the effect of the CLI program on student literacy achievement. CLI’s external evaluator, the American Institutes for Research, concluded that CLI is significantly impacting kindergarten early reading skills, teacher instructional practice and classroom environment in both kindergarten and first grade classrooms, as well as significantly impacting second grade reading skills (2014). The IES report, published in June, is based on a summary compiled by Abt Associates, which provided technical assistance to the evaluators of the i3-funded programs to ensure well-designed and well-implemented evaluations. The report summarizes the findings of the 67 i3 evaluations that were completed in May 2017 and details the extent to which the overall i3 program met its goal of contributing to the evidence base on effective educational interventions. These findings are important because the evaluation results can help ED decide which educational programs warrant additional funding and testing and highlight the value of strong evidence. View a copy of the full report here.